This page is one example of the content being developed by the Col. John Butler Branch in their project: Crown Grants of Loyalists and the Early Settlers Along the Niagara River Parkway. On October 24, 1798 William Burn(s) received a Crown grant of 200 acres for Lot 14, Con. 1, as well as the Broken Front, in Willoughby Township. Little is known of William Burn or Burns. From "The Mark of Honour", we find that William Burn was a young sheep farmer and agent to the Earl of Lord Selkirk. Selkirk had been granted land in Upper Canada between Lake Erie and Lake Huron in the townships of Dover and Chatham. Here, he planned a national Gaelic-speaking settlement of Highlanders. 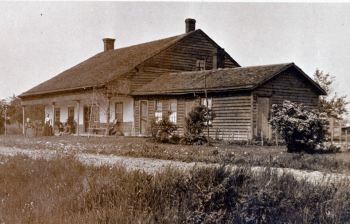 His personal farm, situated on Lake St. Clair in the centre of the colony, was to be its mainstay, and according the "Plan and undertakings" for the settlement, sheep were to be considered the "staple article upon which the profit will depend." William Burn and Alexander Brown with the help of two dogs had driven a flock of 400 sheep, Spanish Merino rams sent from Scotland and ewes collected along the way, throughout the breadth of New York State. At Queens Town Selkirk found his flock " in very good order having taken about a month to travel from Albany." He met with countrymen Robert Hamilton and Thomas Clark, before embarking in a schooner on November 20 for York. Before leaving York for Lower Canada on January 4, Lord Selkirk apparently left instruction that Chisholm was to be supplied with a horse. An "Account of Wm. Burn for Sundries for Lord Selkirk to Thomas Clark" shows an entry on January 7, 1804 of " a horse to Mr. Chisholm�40 Dollars- 16 Pounds." An original Indenture in the Willoughby Museum indicates that Henry Huber purchased Lot 14 from Burn on 29 June, 1802 for 375 pounds, even though Benjamin Bowman was living on the property. Henry Huber (Hoover) Sr. was born in 1754 in Pennsylvania. He was the son of Jacob Huber (Hoover) and Barbara Summers who were Mennonites. On June 28, 1773 he married Margaret Kern in Montour Co., Pennsylvania. Henry and Margaret had five children: David, born about 1778 in Pennsylvania, who married an unknown Rhora; John, born about 1780 in Pennsylvania, who married Rachel Dils ; Nancy Anne, born about 1784 in Pennsylvania who married Martin Fite Sr.; Henry, born in 1786 in Pennsylvania; and Anne, born in 1787 in Pennsylvania. Henry did not keep Lot 14 for long as on 11 January, 1803, Benjamin Bowman and Mary, his wife, had purchased it for 412 pounds, 10 schillings. Jacob Miller Sr. purchased Lot 14 in the first concession and part of Lot 14 in the second concession, with the broken front annexed, 200 acres, on January 18, 1804. He paid 406 pounds, 5 schillings. Lot 14 remained in the Miller family for 180 years. After the deaths of Jacob Sr. on August 3, 1841 and his wife Barbara on August 10, 1841, it passed into the hands of Jacob Miller Jr. and then to his son William Fares Miller. 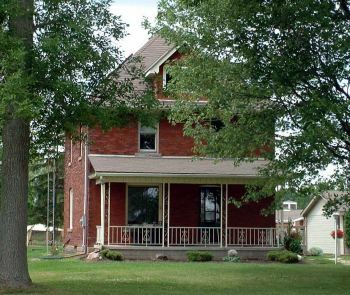 In 1915 William left the property to his children, William Fermin Miller and Zettie May Miller. On her death in 1984, Zettie left the land to Albert and Candace (Lapp) Thwaites. Zettie May Miller was extremely proud of her heritage and donated many of the family treasures and documents to the Willoughby Historical Museum where they may be viewed. 1. Hazel C. Matthews, The Mark of Honour, (Toronto, Ontario: The University of Toronto Press, 1965), p. 145-160. 2. Notes by James W. Morris in the Willoughby Historical Museum. 3. Notes by Zettie May Miller in the Willoughby Historical Museum. 5. Notes by Zettie May Miller in the Willoughby Historical Museum.